This little 18ct gold cross is the Cross of St James (Cruz de Santiago). It is handmade by goldsmiths in Galicia, Spain, and is a truly graceful and fine piece of jewellery. The 1,000-year-old pilgrimage to the shrine of St. James in the Cathedral of Santiago de Compostela is known as the Way of St. James (El Camino de Santiago - in Spanish). Over 200,000 pilgrims travel to the city each year from all over the world to find inspiration and/or deeper spiritual understanding. 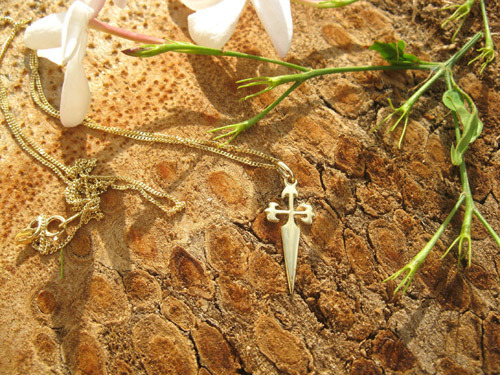 Many carry with them a St James's Cross - believed to promote strength and hope. Wish a friend or loved-one well by sending her (or him) this delicate, elegant and meaningful present. It would make a unique and special gift and show someone you care about them. Dimensions: Cross measures 22mm long by 10mm wide, total length is 25mm including the hanging ring, and is shown hanging on an 18" 18ct gold fine curb chain. Handcrafted by goldsmiths in Galicia, northern Spain: Quite delightful. You can select WITH or WITHOUT gold chain. Gift this truly special St. James Cross to inspire your friends and loved-ones and help them to be resolute and feel safe in their life. Would make a very special present for a Christening, a Wedding, or an inspirational Easter gift. Comes gift-wrapped, like all our presents - and we can print a personal message on your behalf.